I’ve planned a really fun menu for July! It has a lot of my favorite recipes as well as a few new ones, and it totaled up at only $245! Get the full version of July’s menu with a weekly breakdown of the menu and grocery list with tip and tricks to make dinnertime flawless along with all of the recipes included in the menu for only $3. I really love menu planning, especially in the summer. There are so many more ingredients available, making grocery shopping easy and a heck of a lot cheaper. As in previous months, I shopped around to get the best deals on groceries, buying most of my canned goods at Walmart. I can get organic canned tomatoes at Walmart for the same price as conventional at my local grocery store. Also, consider shopping your local farmers market to get fruits and veggies! You’ll be supporting your community, and saving money. Plus, you’ll never be able to get veggies that taste as good from the grocery store. Being from Canada, I wanted to share a Canadian classic for Poutine to celebrate Canada’s 150th birthday! Canada is a beautiful country that I am very proud to call home. So, celebrate with me on Saturday and try poutine… I mean really, what can be wrong with French fries, cheese curds and hot gravy?! Absolutely nothing, that’s what! Sooooo goooooood! To celebrate the 4th of July, we wanted to cook up one of our favorites, and an American classic, BBQ ribs. We’re serving them up with some grilled corn-on-the-cob and a loaded baked potato salad, topped with extra bacon, of course! We’re lying low this year, and that’s okay, because some good food, family and fireworks is all I need! What are your plans for the 4th? Included in this post is a copy of July’s Menu with a grocery list for the month. To download recipes, please click on the recipe name in the list below. It will bring you to the recipe page where you can view step-by-step instructions with pictures, and download and print a copy of the recipe in PDF format. All NEW recipes for the month will be shared throughout the month to keep content fresh. So, what’s for dinner in July? Foil Pack Chicken Fajitas – NEW! Get the printable copy of the monthly grocery list and recipe by clicking the link below. What recipe are you most looking forward to? Remember the weekly breakfast, lunch and dinner menus? They are coming soon, so keep checking your inbox for a first look at weekly menu plans. Walmart To Go – Grocery Delivery That Saves You Both Time & Money! 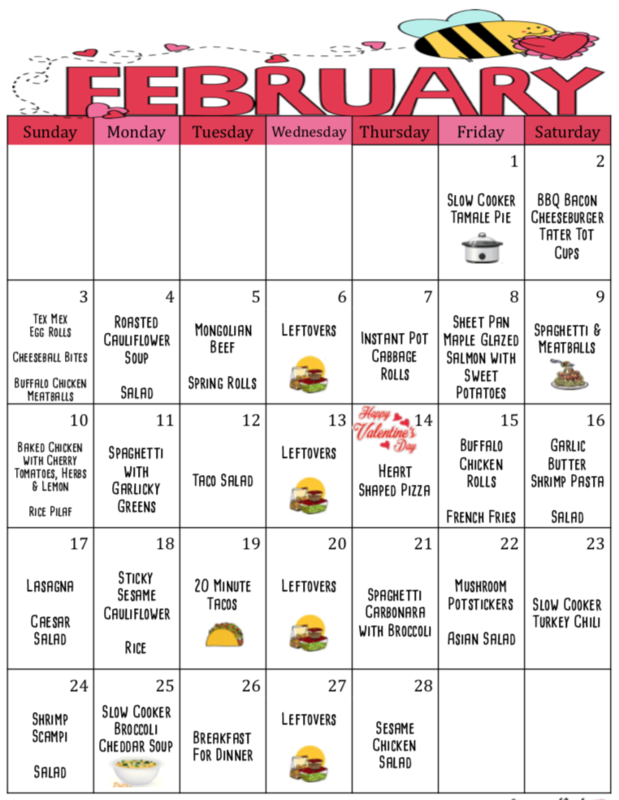 Get In The Groove Of Saving Money On Groceries With February’s Budget Meal Plan! 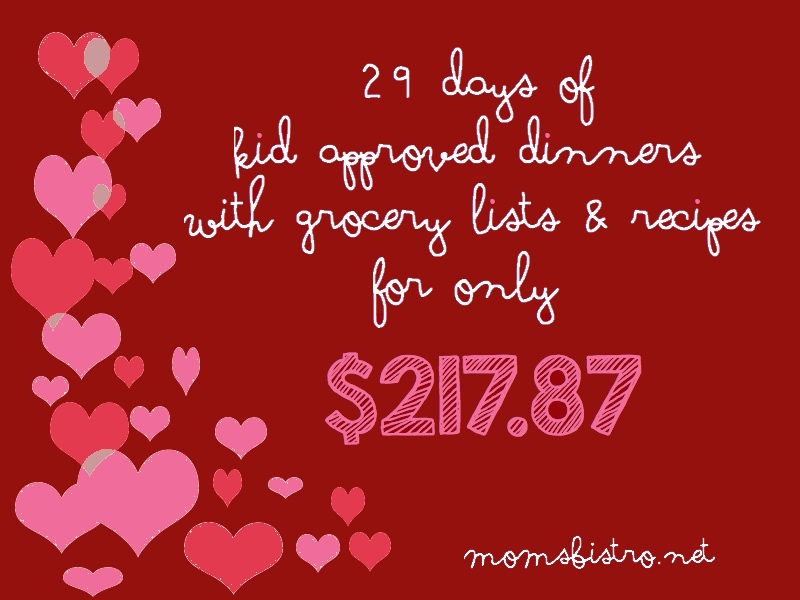 A Month of Kid Friendly Dinners for $217.87! Was looking forward to the Bacon Cheeseburger sliders. When will it be posted here?